Archi-gymnasium or the old university is one of the key buildings in the city-centre of Bologna in northern part of Italy. Though unassuming from the outside, it is also one of the most beautiful buildings of the city. It includes the old anatomy hall which had played an important role in modern understanding of the human body and the evolution of medicine. Many persons feel a macabre fascination for scenes of post-mortems in TV serials about crimes, police and medical investigations. In fact such TV serials are very popular. 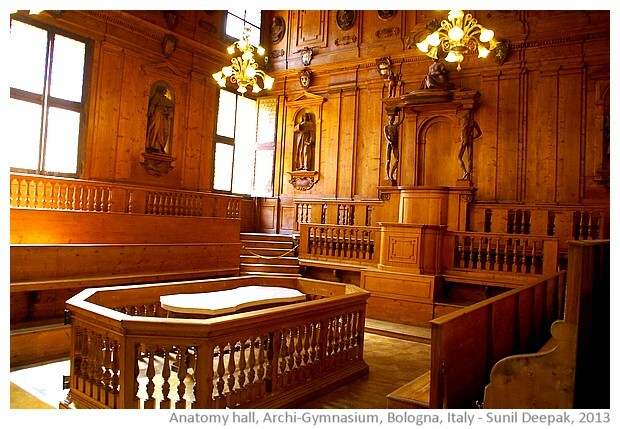 The anatomy hall of Archi-gymnasium can be considered as a medieval equivalent of such TV shows because, at that time, cutting up of the human bodies was not just about scientific knowledge, it was also about public entertainment. Join me in this "history-arts-science tour" to discover this wonderful place. It is full of coats-of-arms of the royal and noble families of Europe that cover its walls and roofs, creating a wonderful baroque effect. 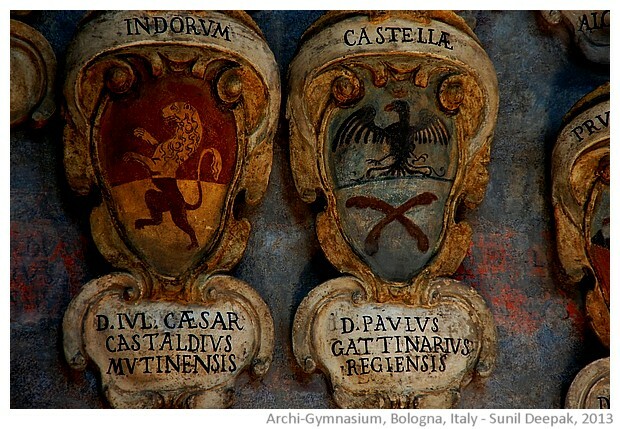 Thus, you can also call it "Coat-of-arms museum" of Bologna. The word "gymnasium" originated in Greece, where athletes used to practise naked (gymnos). With passage of time, athletics, education and medicine were seen as part of one group of activities for developing the mind and the bodies of persons. Thus, they started to use the word gymnasium for education institutions also. After a short corridor, the entrance leads to a square-shaped courtyard surrounded by porticoes. The building extends mainly in a horizontal direction, parallel to the street outside. However parts of the building on the ground floor are not open to public. Across the entrance, on the first floor is the anatomy hall, while two corridors in the front lead to smaller rooms and some big halls. Thus, it has a simple layout that gets its charm from the symmetry of the square courtyard and the gentle porticoes, adorned with colourful coat-of-arms. 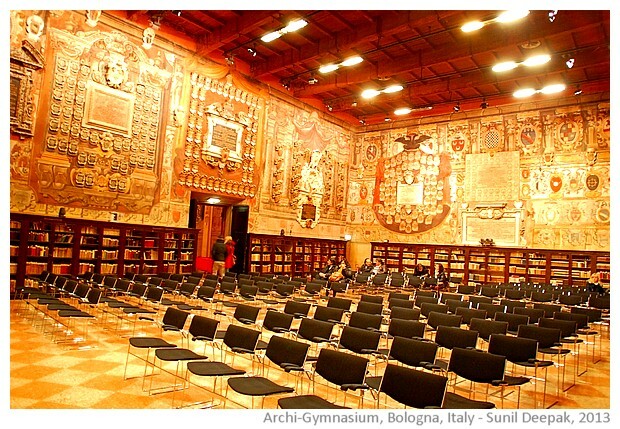 Bologna university started as a law school in 1088 AD, and was considered as the oldest university in Europe. The first university statute was approved in 1317. At that time, university education was structured along two main disciplines - Law (including civil law and canonical law) and artistic studies (including philosophy, medicine, mathematics, physical and natural sciences). 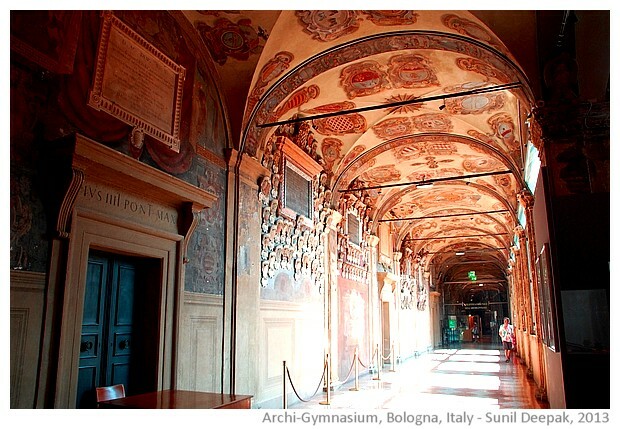 In 1562, when Bologna was part of the Pope's empire, it was decided to build the Archi-gymnasium to bring together all the schools scattered in different parts of the old city. It was called "the new school building". The law faculty was considered more prestigious and thus they occupied the rooms along the main corridor, while artistic disciplines were considered less prestigious and they were given the rooms on the opposite side, on the back of the building. There were rivalries between the two groups of students and thus, to avoid mixing with each other they were supposed to use seaparate stairs. In 1838, Archi-gymnasium became the municipal library of Bologna, while university schools were shifted to other buildings. The archi-gymnasium building was damaged when Bologna was "liberated" from the Pope's reign by the army of of Napoleon. However, more serious damages occurred in 1944, during the allied bombings, during when some parts of the building were destroyed, and were rebuilt after the war. You can make out these rebuilt parts of the building as they do not have the frescoes. The archi-gymnasium building has the world's largest collection of coat-of-arms from different countries - it has about 7000 of them. These coat-of-arms represent kings, barons, dukes, lords and other nobles of Europe and some other countries. Each coat-of-arm can be the object of a research to understand the meanings of its symbols, why they chose a particular motto to represent them and what happened to that family. I have seen some research papers on individual coat-of-arms displayed in this building but I have not seen any comprehensive studies on the whole collection. To research the seven thousand coat-of-arms would require a huge effort. Some of the coat-of-arms are very curious like the ones in the image below. On the right side, the coat-of-arms represents someone from Gallorum (Wales) and its motto is "Non semper imbris" (Not always it rains) and the logo shows a timid sun peeping through the clouds - I wondered why would a royal family choose such a coat-of-arms? The coat-of-arms in the centre is from Portugal and its motto is "Nec tibi nec michi" (Neither you nor I), and it shows a man plucking a fruit from a tree, while a dog is ready to jump on him - once again, I asked myself, why would a royal house choose such a coat-of-arms? If you are curious about such things, you can spend days or weeks in the archi-gymnasium peering at the coat-of-arms and trying to guess their histories. 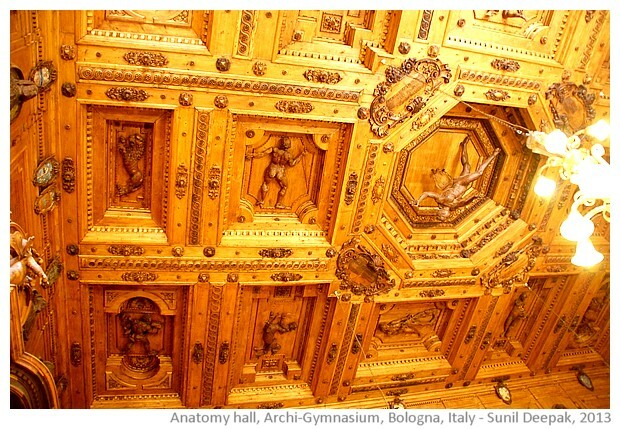 The anatomy hall is the jewel-in-the-crown of the archi-gymnasium - it is exquisite with wood panels and carvings. Teaching of medicine was introduced in Bologna university in the thirteenth century. Till then the texts of Hippocrates and Galen written in pre-christian era were used to understand anatomy, though they were based on the study of animals. Dissections of human bodies started in Italy around thirteenth century. Bodies of hanged criminals were usually used for dissections. The first public human dissection in Bologna was carried out by Mondino de' Liuzzi in 1315, who later wrote a well known manual on this subject. At that time, this anatomy hall was not there, only some temporary structures were built and then removed. The dissection of human bodies was done in public - it was like a fair or an entertainment event, in which public came to watch. It was also organised as a part of the carnival festivities. Andreas van Weasel (1514-1564), a Flemish anatomist, is considered the father of modern human anatomy. He had also taught in Bologna university for some time. Around that period, anatomy classes were organised in 16 lessons, during which professors read from texts, while surgeons used to make incisions and show those parts of the body to the public and to the medical students to illustrate the text. However, the church that ruled Bologna in that period was not always happy about human dissections. For example, Gaspare Tagliacozzi (1546-99), a professor of anatomy and surgery at the Bologna University, was famous for his plastic surgery techniques. His book "De curtorum chirurgia per insitionem" (The surgery of defects by implantation), printed in 1597, was the first European scientific treatise on plastic surgery. The Church regarded plastic surgery as an interference in the divine affairs and thus Tagliacozzi was excommunicated. The decision to set up the first anatomy hall in the Archi-gymnasium was made in 1595. That first anatomy hall was later demolished. 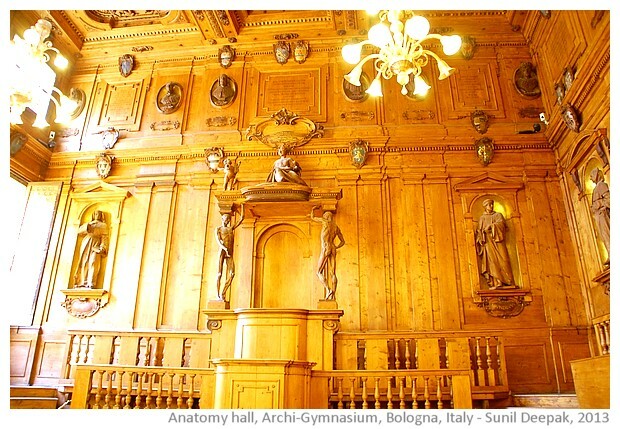 Since large number of persons were coming to see the dissections of human bodies, in 1631, it was decided to make a second and a bigger anatomy hall.This is the anatomy hall that you can still visit in the Archi-gymnasium. It is a rectangular room, with a dissection table in the centre and the teacher's podium on the right side. This hall was used till 1803, when the anatomy department was transferred to Palazzo Poggi on Via Zamboni. The roof has the statues of the Greek god of medicine Apollo in the centre, surrounded by 14 constellations including Gemini, Virgin, Sagittarius, Aquarius, Leo, Boote and Andromeda, as shown in the two images below. This indicates that in those early centuries of scientific understanding, most people still believed in astrology and the influence of stars. Finally on the speaker's podium on the right side of the hall, there are two statues of the "Spellati" (Without skin) showing the main groups of muscles of the human body. 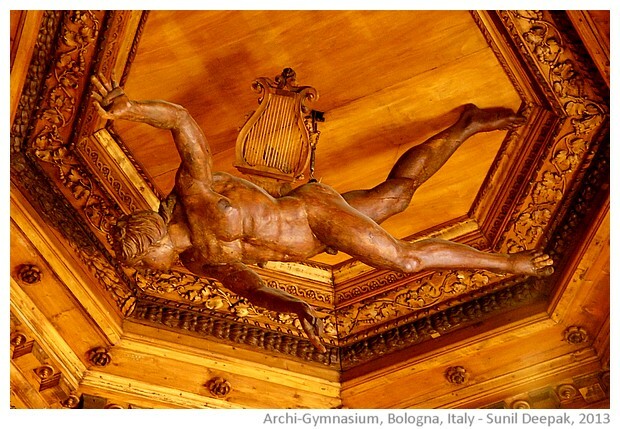 These were made by Ercole Lelli in 1734, a sculptor famous for his wax-statues used for studying anatomy. You can admire many more works of Ercole Lelli at the science museum of Bologna in Palazzo Poggi on Via Zamboni. 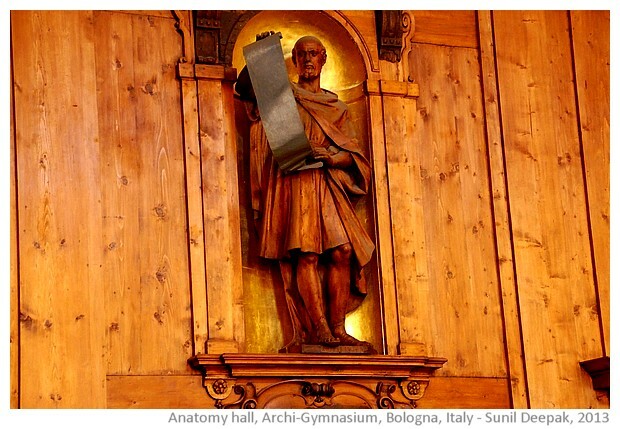 This part of the post is not about Archi-gymnasium, but rather it touches on another aspect of human history, that is to put into wider historical perspective the role of the anatomy hall in Bologna. Though we often think that globalisation and exchange of information and skills between countries is something recent, the history tells us of antique links between far-away cultures and countries. Thus, I think that science and human knowledge do not move and develop in isolation, but rather different parts of humanity contribute to this process. The Charaka-Sanhita (The treatise by Charaka) and the Sushruta-Sanhita (The treatise by Sishruta) in India are among the oldest known medical treatises. They are part of Ayurveda (the Indian science of medicine), going back to pre-christian era. Charaka-Sanhita deals with medicine and has only a few passages on surgery. The Sushruta-Sanhita deals with surgical knowledge and describes seven branches of surgery - Excision, Scarification, Puncturing, Exploration, Extraction, Evacuation, and Suturing. It also touches on nose-surgery (plastic surgery), eye-surgery (ejection of cataracts) and the study of anatomy in the dead bodies. An Egyptian papyrus from 1600 BC has shown that the ancient Egyptians also knew about anatomy of human organs like heart, liver, spleen, kidney and hypothalamus. The ancient Egyptian techniques of mummification required taking out of the internal organs and placing them in separate jars. Bows and arrows first and rifles and guns later, allowed people to wage wars on the others from a distance, but for the most parts of the human history, fights were by direct combat including through the use of swords and other sharp-edged weapons. The Mayan practice of sacrifice included taking out of the victim's heart. These practices must have provided additional opportunities to the ancient vaidyas, shamans and barber-surgeons for learning about human anatomy. I think that a part of my fascination for the Archi-gymnasium depends upon my background of being a doctor. When you join a medical college, usually anatomy is the among the first subjects that you study and the anatomy dissection hall is the first contact between the medical students and the human bodies. I still remember my first look at the body of a woman in the anatomy hall of the medical college in India and the sensation of giddiness as our teacher had shown us how to make the first skin incision. The pungent smell of formalin-soaked human bodies and our nervous laughs as we had learned to open them for learning, are still vividly etched in my memories. Yet, I think that my love for this beautiful building goes beyond the affinity for the anatomy hall. 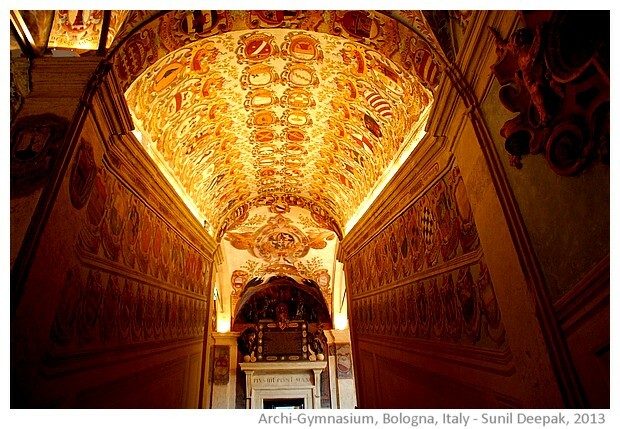 For the culture and the art enthusiasts also, the Archi-gymnasium offers so many treasures. These developments in sciences also had an impact on arts such as paintings and sculptures - knowledge of anatomy, geoglogy, physics of the light, all of them transformed the way artists painted and sculpted. 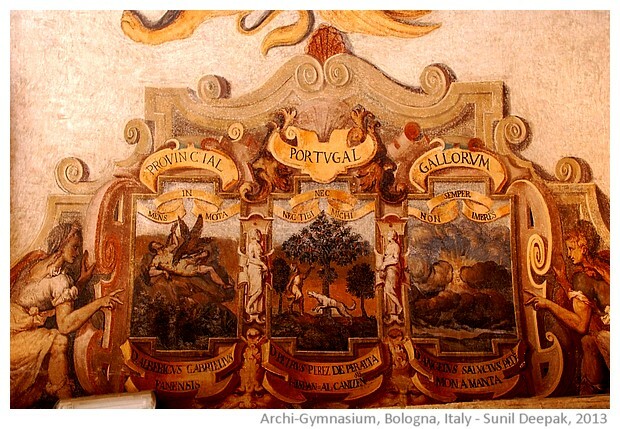 For example, in another post about paintings in San Giacomo church of Bologna, I have written about the influence on artists of the works of Aldrovandi in the areas of natural history and geology. 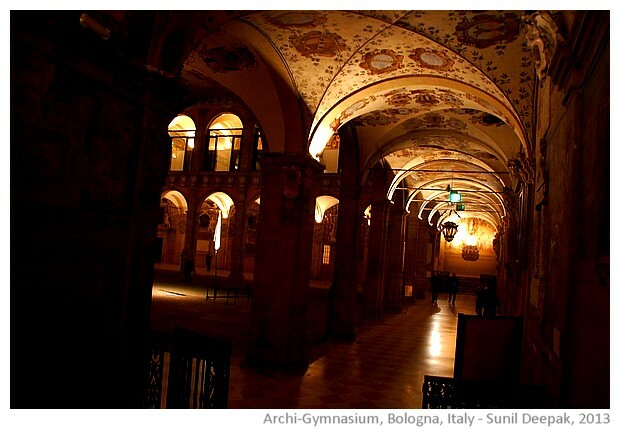 So if you are visiting Bologna, keep some time for a slow and lingering visit to the Archi-gymnasium and you may also like to take a look at my other posts about Bologna! That's very informative, Sunilji!! Thanks for sharing.I will be having an exhibition in Bolgna in November.don't know if I will be able to make it but this Info will help me if I can. Also hope to see u there!! The history of the study of medicine and anatomy is fascinating. But my favorite tidbit is the coat of arms Not Always It Rains. An amusing motto for a royal family from the British Isles. Thanks No Vember for the clarification :) and your appreciation!